Who/what can you trust as a valid review? Who cares about service, not only money? Who runs a business and not a money machine? Who treats people as brand advocates and not dollar signs? While consumers question faith, reliability, and commitment of brands, brands that cut corners and treat consumers interchangeably do not present a quality solution to the poor relationship. Testimonials ease a universal concern of consumers; testimonials are positive signals related to a given brand straight out of the mouth of fellow consumers. Consider the difference between testimonials made in Hollywood basements (actor-based television commercials) versus sentiments relayed by ‘actual’ people who use mentioned goods and services; doesn’t the message of the latter party earn your trust more than the actors? Particular ads feature ‘actual’ consumers who use, react, and wax poetic on products and services. Perceptive marketers use feedback in smart ways; why spend money on advertising when avid advocates will offer free testimonials? Would you like to use your advocates in a genuine and unique way? 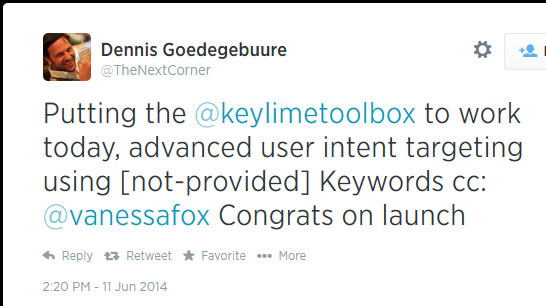 Use AllMyTweets, making Twitter a sounding board. Listen, react, and take screenshots of positive and real-time sentiments. Vanessa Fox is well-known in search marketing and newly offering a service. 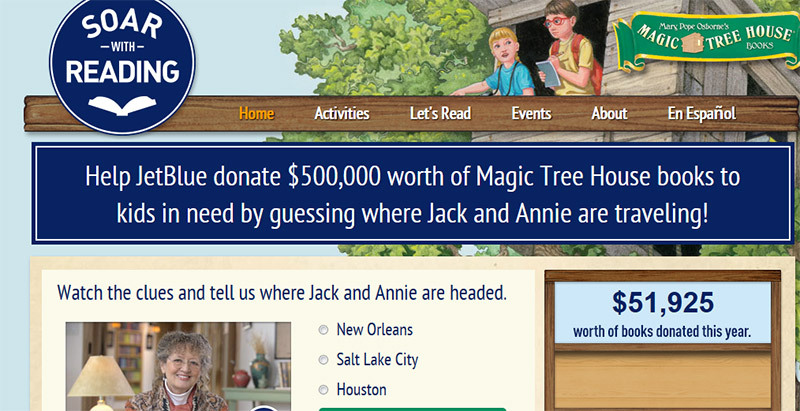 Since her site is new, she can use her legacy and established influence as testimonials. Vanessa’s potential consumers may recognize Dennis from the industry, or in the least appreciate input from an actual and online traceable personality. It’s a signal of trust; those interested in Vanessa’s services for the first time have more positive signals to help make an eventual decision and purchase. Consider the level of anxiety regarding an interaction with an evasive online personality versus an owner you can contact personally, one with a ‘tangible’ online personality. The Web introduces incredible remote opportunities, yet it’s a brand’s job to compensate for the distance, catering to consumer anxieties. While it’s easy to buy friends and followers online, it’s harder to earn trust and build a name by helping others. Actively seek those with questions online. 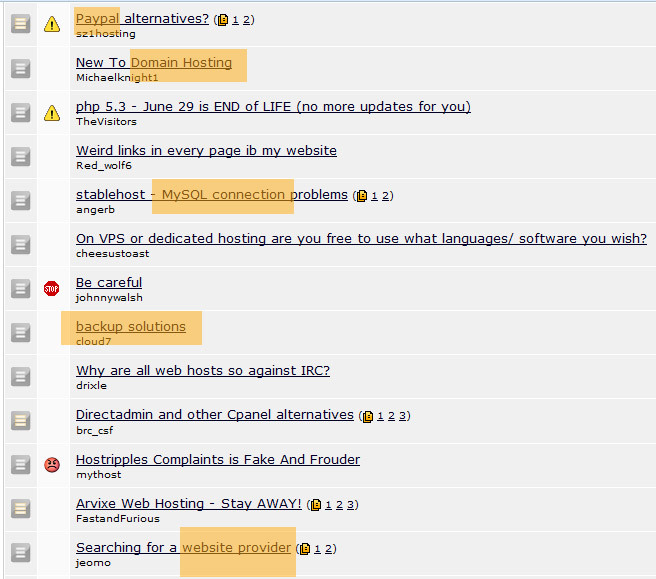 Locate forums and question-and-answer platforms related to your business. Use search operators to target forums and questions related to an area of expertise. Because hosting initially targeted, we can assume these questions, though unique in, are related to the broader topic of web hosting. An owner can address questions per person; write a blog post to answer popular questions; and, engage those with questions on LinkedIn, Twitter, Facebook, etc. ‘Free’ advice, though void of initial monetary value, helps build trust and recognizable brands. Donate time toward helping others; it is time well spent. Here’s a reminder – we don’t all agree with you. It’s a tough reality the ego suffers; people disagree, but sometimes they do agree, and hopefully appreciate the opportunity for conversation. Negative reviews plague open-source platforms – so much that owners cry, rant, and threaten legal action to hide or rid the Web of negative sentiments regarding their brands. Have you ever met a perfect person? If so, please tell us about them in the comments! If you have not captured a golden unicorn eating bacon Cheerios by the sea of cheese, you’re like the rest of us – prone to faults yet committed toward improvement! This is a horrible headline; one you do not want aligned with your brand name. To counter quick spreading insinuations that JetBlue employees torture paying customers and children, the brand does not have a lot of time to ‘tell their side’ of the story. Rather hide and try to rid the web of disasters, others’ disagreements, and signs you’re less-than perfect, it’s genuine and trustworthy to accept what’s transpired and move forward responsibly. Jon Henshaw of Raven had an interaction with a disgruntled user, and rather hide from the issue, Jon decided to have an open conversation. The consumer/blogger updated his post to reflect Jon’s participation. Disagreements, bad reviews, and less-than-perfect sentiments are bound to occur. It’s more important and human to accept the past and proceed with grace. The web dilutes and sensationalizes information, making it difficult to remember specific events. JetBlue will attend to the issue and carry on. However, people remember resolutions, if a brand proceeded in a humane and respectable manner. Mistakes happen yet character develops. Consider a twist on negative reviews and have a PR person peruse search results and reviews; host the feedback (positive and negative) on your site; take time to address issues in a logical and helpful manner, showing customers how your brand evolves rather than deflects. 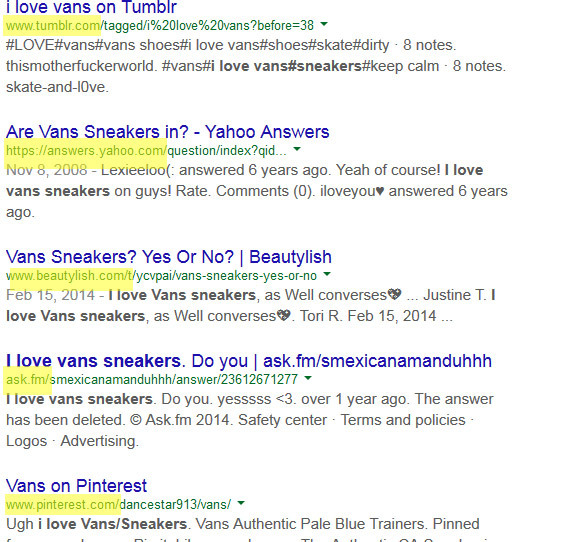 The highlighted URLs host a number of positive (I love) sentiments related to Vans. The brand can use such reactions along with their paid advertising. However, to be a bit more realistic, Vans could consider why some people do not like the brand or host grievances about particular products. 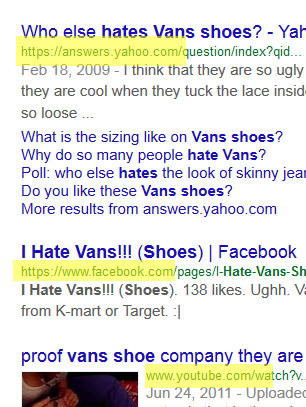 (With a grain of salt – it is the Internet) Vans can consider negative sentiments as well, using a public forum or the brand site to feature unique or common grievances and respond accordingly. Consumer relations are a lot like (wait for it) human interactions. It’s much easier to relax and provide trust when someone has taken the time to appreciate you the listener, viewer, speaker, etc. Cam Secore operates a number of online initiatives, and is most proud of Power Moves, where he reviews his favorite tech products. He loves the Red Sox but does not actually own any socks of that color.